A wonderful hotel complex set in two main buildings with an excellent range of leisure activities and a high standard of accommodation. 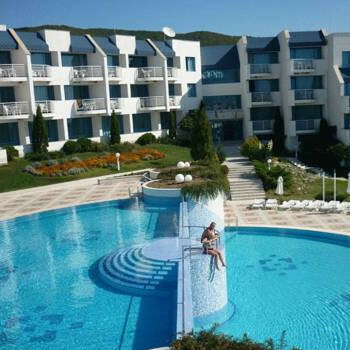 Situated in the holiday village of St. Vlas and only 4km from the centre of Sunny Beach. A nice hotel right on the beach as in its name. The hotel groups is german owned and caters towards them but this not a problem. A good value hotel and great village just outside sunny beach so best of both worlds. Hotel staff were excellent on rrequests and mini bus from hotel was well orgnaised and on time. Will be going back in 2007 with a party of 3 as excellent value and a breath taking view from the hotel of the Black sea. This Hotel is just superb, very clean, spacious,friendly and very well laid out...the season was only just starting when we were there but the hotel did what ever they could to make you feel at home. Taxis into Sunny Beach cost 15 Lev's and to the airport a taxi should cost no more than 50 Lev's, and the shuttle bus cost 5 Lev's return to Sunny Beach. The hotel pool was just so so cold but please bear with it as when your in it's worth the suffering. Food was really very good, not cold at all as other guests say. The hotel night club was empty every night but then it was low season! Go for the merc taxis owned by Sevi and his brother they are just great people. You will have to go into Sunny Beach for night life as there is nothing to do around the hotel but swim and relax. All in all the hotel was faultless and would give it 110%. Location has alot to be improved but maybe I will give it another shot in 5 years when the area has been developed more. Stayed at the Sineva Beach Hotel, actually the sister hotel of the Sineva Hotel. The hotel is a 4 star and the room could not be faulted, with a fantastic sea view and spotlessly clean. The hotel food was ok however it does cater more to the german tastes who have been going to Bulgaria in numbers for quite a lot longer than the British. The staff were very helpful. There was no entertainment in the hotel while we were there but the programme was starting in the nightclub from Monday 6 June 2005 so it was very quiet, which is just what we wanted. Nice hotel but in wrong location. Staff could not speak good English. Food was terrible always cold in the end we ate out in Sunny Beach. There is nothing to do in St Vlas very poor for English children as they speak mostly German to them. The only good thing was that your room was always cleaned. Stayed at Sineva Beach Hotel, Vlas on the Black Sea. The room was full of damp and smelt awful, though it was cleaned to high standard every day. The location was excellent, virtually on the beach of the fabulously clean and warm Vlas Beach. Surrounding area was beautifully laid out, everything neat and tidy, certainly an elite resort. We stayed at the Sineva Beach Hotel. Very clean, staff excellent, rooms cleaned to very good standard. Food- we did not enjoy food, catered more to German, Swedish taste, after paying full board ended up eating out in Sunny Beach every night. Downside, no entertaintment at all at night, small bar with couple of bench style seats,no atsmopher at all, therefore difficult to meet other hotel users socially, we found this big drawback because we were told hotel would have entertainment every night,result was when we just wanted to wind down and relax at night,had to travel to Sunny Beach for some form of entertainment. Would go back but only if updated itself (hotel). Reps were never to be found for our company. Must admit hotel massage excellent. Word of warning, if going to Sunny BeachDo not buy Cigarettes from street markets, they are NOT english cigarettes. We had a pleasant stay in the hotel as it was very clean and the hotel staff were excellent. The pool was big- big enough for everyone in the hotel with plenty of sunbeds to go around.Lots of other facilities eg. childrens entertainment, massage, manicure etc.The rooms were good as they had everything you needed- a balcony, bath, shower and other extras. The food in the hotel was a bit cold, but that was because Bulgarians eat their food that way.Lack of entertainment, but it meant the hotel was quiet in the evenings.